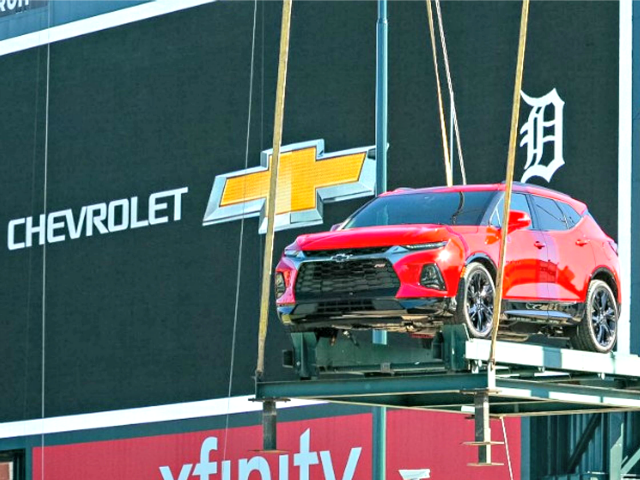 GM had perched the made-in-Mexico Chevy Blazer on an enormous Chevrolet display — alongside the Chevrolet Silverado which is made in Fort Wayne, Indiana — in Comerica Park for the Detroit Tigers’ opening day this week. GM executives’ decision to display the Chevy Blazer for opening day at Comerica Park came after the corporation decided to lay off thousands of American workers of the last two years, and most recently shuttered the Lordstown, Ohio, assembly plant — resulting in the immediate layoff of about 1,600 U.S. workers at the plant and experts predicting more than 8,000 Americans laid off from supporting industries in the area. Comerica Park is the home of the Detroit Tigers, one of the country’s oldest baseball franchises. GM has featured its vehicles on the Chevrolet Fountain at centerfield for 10 years. The made-in-Mexico Chevy Blazer, though, quickly came under fire from Detroit locals. “When you have people that are being put out of work that you should stand behind your product, stand behind the people that support you and put it on display,” Detroit resident Katie Cesarz, who believes the display is insensitive to American GM workers, told WXYZ-TV Detroit. The display of the made-in-Mexico Chevy Blazer also garnered immediate backlash from United Auto Workers (UAW) members and state representatives. Rep. Tim Ryan (D-OH), who represents the district that includes Lordstown, Ohio called GM’s display of the made-in-Mexico Chevy Blazer a “slap in the face” to American workers and those whom GM has laid off over the last few years to outsource production to foreign countries. Following the uproar from American workers, GM decided to scrap the Chevy Blazer display and changed it out for a Chevy Traverse, which is made in the U.S. While GM has laid off its American workforce in Lordstown, and plans to lay off thousands of more Americans this year by closing its Detroit-Hamtramck and Warren Transmission plants in Michigan, as well as the Baltimore Operations plant in Maryland, GM is ramping up production of electric cars in China and offshoring to foreign countries to cut hundreds of millions in labor costs to widen their profit margins. As has been seen with other working and middle-class American communities, outsourcing and offshoring of U.S. manufacturing industries and jobs to cut labor costs for corporate executives has devastated entire regions of the country. American manufacturing is vital to the U.S. economy, as every one manufacturing job supports an additional 7.4 American jobs in other industries. Decades of free trade, with deals like the North American Free Trade Agreement (NAFTA), has eliminated nearly five million manufacturing jobs from the American economy and resulted in the closure of nearly 50,000 manufacturing plants.